Angenieux 11.5-138mm HR T2.3 Super 16 Zoom Lens W/ Custom Lens Support, Custom Zoom Gear and Dual-Sided Zoom Scale, PL mount. Completely overhauled in August 2002 by Horizon Optics. Price $10,950.00. The Angenieux 11.5-138mm HR was developed from the design of the 10-120mm T2.0. The 10-120mm was Angenieux’s answer to Zeiss’ very popular 10-100mm T2.0. Angenieux upped the ante by going to a 12:1 zoom range design, at the same T stop, and used a much larger focus scale which was much better suited for “production” film work, (episodic televison, music videos, feature films for blow-up to 35mm, etc. ), as opposed to the very compressed focus scale on the 10-1 Zeiss zoom. The 10-120 lens incorporated Angenieux’s new High Efficiency Coating (HEC), first introduced with the 25-250mm HP T3.7 zoom for 35mm. This extremely efficient HEC multicoating, transmitting 99.8% of light, greatly increases the sharpness and costrast of zoom lenses. The 10-120mm was the first zoom lens that Angenieux was able to market at being “equal to or better than the finest fixed focal length lens”. This lens offered diffraction limited performance at T4, which means that all lens abberations are fully corrected, and the only limit on resolution is the bending of light rays (diffraction) around the edges of the iris blades. Truly remarkable performance for a zoom lens. Century Precision Optics advertisement for 11.5-138 HR in American Cinematographer. (PDF file). When Century Precision, then the exclusive dealer for Angenieux film lenses in the U.S., introduced these lenses in 1993, they were priced at $16,950.00. 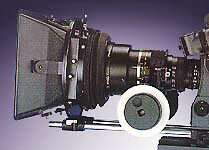 In 1999, Angenieux discontinued the 11.5-138 HR, in favor of their new 7-81mm HR Super 16 zoom lens. List price in 1999 was $19,700.00.